Ideal to convey items with irregular bottom surfaces, small items that could fall between rollers or bags that could sag between rollers. For light to medium loads. 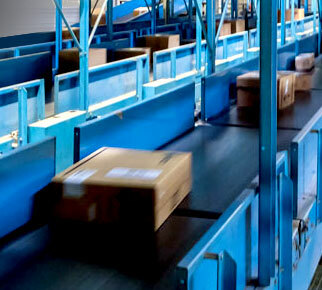 One of the most popular conveyor types in use. Conveyor belt slides across a solid metal frame with pulleys at either end. An inexpensive, quiet, easily-installed conveyor. Load per linear ft: 75 lbs. max. Available overall widths: 10", 12", 14", 16", 18", 20", 22", 24", & 28". Rugged, heavy duty slider bed ideally used for long assembly line operations, inspections, testing, sorting, and packing. Larger drive and tail pulleys give this conveyor a higher load capacity than the similar model TA. Load per linear ft: 100 lbs. max. Available overall widths: 30" & 42". Integrated guard rails help contain the load, and is ideal for overhead conveying applications. Also well-suited for conveying loose parts to contain the load, or where product stability may be in question. Load per linear ft: 75 lbs. max. Available overall widths: 8", 10", 12", 14", 20", 26", & 32". A much higher load weight capacity than slider bed conveyors by reducing belt-against-bed friction. Also has a channeled frame equipped with a single transition roller on the end of the conveyor bed. Load per linear ft: 225 lbs. max. Available overall widths: 18", 24", & 30"
Trash conveyors handle empty cartons, boxes, trash and other lightweight loads. Excellent where boxes are being opened, and contents removed to keep facility much cleaner and more organized, and doesn't require collection employees. Model TS1500 belted curve conveyor provides positive flow of product with a belt driven by tapered pulleys. Can transport a wide variety of products. Available in 45°, 60°, 90°, and 180° turns. Use for loads too small or irregular to be conveyed on rollers.